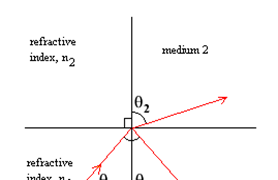 2. where light goes from a material with a high refractive index to one with a low refractive index. 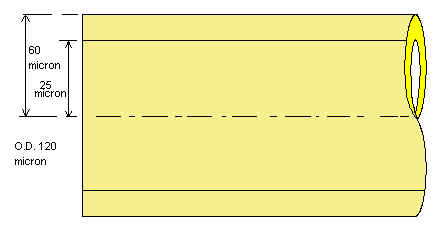 These two cases are shown in the diagrams below. 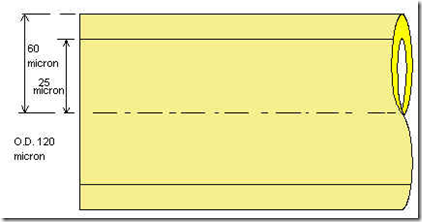 In the second case above, θ 2 is always greater than θ 1 . So, as we increase θ1, eventually θ2 will reach 90o before θ 1 does. 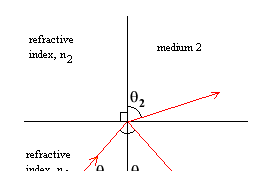 At this point where θ1has reached a value called the critical angle (θ c ). The transmitted ray now tries to travel in both materials simultaneously For various reasons this is physically impossible so there is no transmitted ray and all the light energy is reflected. 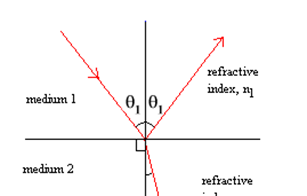 This is true for any value of θ1, the angle of incidence, equal to or greater than θ c This phenomenon is called Total Internal Reflection (TIR). 1. The refractive index of the first medium is greater than the refractive index of the second one. The phenomenon of TIR causes 100% reflection. In no other situation in nature, where light is reflected, does 100% reflection occur. So TIR is unique and very useful. Optical fibers are very fine fibers of glass. They consist of a glass core, roughly fifty micrometres in diameter, surrounded by a glass "optical cladding" giving an outside diameter of about 120 micrometres. They make use of TIR to confine light within the core of the fiber. 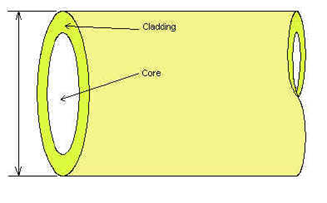 The core has a higher refractive index than the cladding. 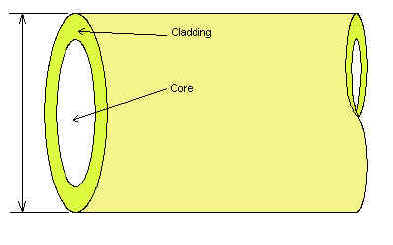 Although the cladding does not carry light, it is nevertheless an essential part of the fiber. The cladding is not just a mere covering. It keeps the value of the critical angle constant throughout the whole length of the fiber. Optical fibers are optical waveguides. This means that wherever the fiber goes the light, which is confined to the core of the fiber, also goes. So optical fibers can be used to make light bend round corners.